Feel the rumba. All photos by Alexie Cespedes. Alexie Cespedes is a travel agent for Cuba Travel Network in Havana, Cuba, the town where he was born, raised, and has worked ever since. So the man knows a thing or two about living (dancing! drinking! partying!) passionately in the nation's capital city. HAVANA, Cuba – When you are born and raised in Havana, you understand the city's historic architecture spanning the centuries. Spain's influence with the Morro Castle, the Soviet Union's intimidating Russian Embassy, the Belle Epoque mansions suspended in time. You are also raised with an extensive index of American classic cars from the 1950s (I can identify the model and make of almost all that exist in Havana). Of course, we are all schooled on Hemingway too: his work, the numerous places he lived, the even MORE numerous places he drank, and the locations in which he wrote his most famous literature. All of that makes up the fabric of our city. Here's where to find it. Because, in Cuba, the three are inextricably linked. Not only is it a Cuban five-star hotel with a lovely staff, large rooms, and a great location in Old Havana, but it's a little-known secret that one of their bartenders, Andrés Piñon, is an award-winning international cigar sommelier. You don't have to make an appointment with him to access his knowledge, just huddle up to the bar and strike up a conversation. Located in the basement of a mansion in Miramar, outside of the normal tourist area. Definitely off the beaten track, and you won't find a huge amount of tourists here. The most popular cultural program in Havana. The multifunctional space is a mixture of art gallery, bar, dining establishment, and music venue. "FAC" (pronounced fahk, with a little laugh) feels like it belongs in NYC. Locals party on two great dance floors until 4 a.m. This is one of the best places to visit in Cuba right now. Excellent atmosphere and tasty tapas. Even with the ironic sign "Hemingway was NEVER here" it's still hard to get a table. This historic bar reopened in 2013 after being closed for 48 years. During the 1940s and '50s, hundreds of American celebrities walked through its doors. A must-see when you're in Havana for the history alone, it featured in the movie Our Man in Havana with Alex Guiness. All walks of life have left their mark in this famous (and tiny) indoor-outdoor bar, whose claim to fame is the creation of the mojito cocktail. It's touristy, but a must. This great bar is an old oil mill. Cuba is well known for historic restoration and repurposing of old buildings and such. This is one of the great examples, and it's one of the best places to enjoy a gorgeous Cuban sunset. The name means "The Vixen and The Crow," and this is the most famous jazz club in Havana, perhaps the world. Open at 10 every night, guests enter through a red English phonebooth and walk through a dark basement. The club has hosted big names in jazz, including Chucho Valdes and George Benson. Rumba is part of our culture. Born out of the abolition of slavery in Cuba in the 19th century, it brings together elements of African and Spanish music and dance. It's first and foremost a creative expression, but it's also connected to storytelling, culture, and religion. No instruments are necessary. Clapping your hands is enough to begin a rumba. There is choreography, but spectaors can also join in. 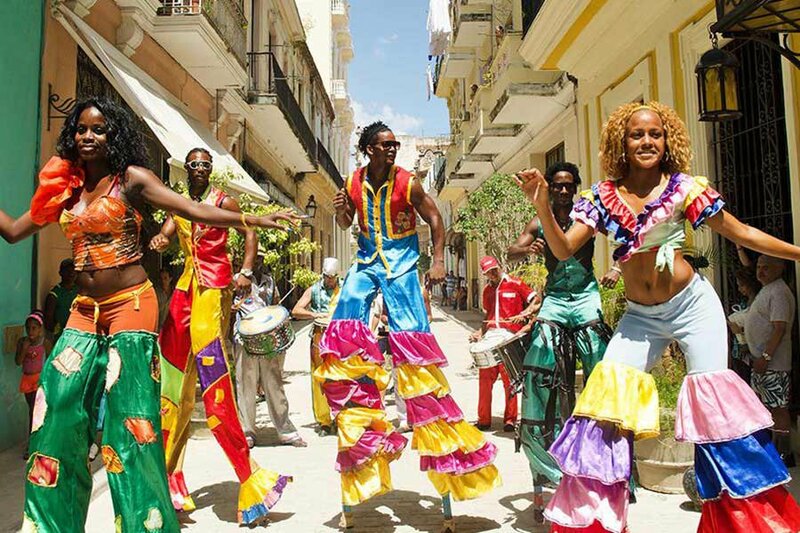 There are seminars about the folklore of each of our Cuban provinces and song and dance lessons as well. Located in Jaimanitas on the western side of Havana, it's a simple wooden shack on the water serving the freshest fish and sushi. Boats pull right up for lunch on the terrace. It doesn't feel like you're in the middle of Havana here but rather like a vacation away from the hustle and bustle of the city — with some of the food in Havana. The outdoor terrace is enough to lure people in for views of the bay and spectacular sunsets. Rio Mar feels like a bit of Miami in Cuba. Great service, spectalar food, craft cocktails and bay breezes. The distinctive flavor of grilled chicken and black beans asleep make this "ranchon" one of the simplest yet most authentic restaurant serving Cuban food. It also has one of the best wine lists in Havana. The must-have roast chicken is served with rice, black beans, fried plantains, and a sauce that is a state secret. Which may explain why it's been drawing the diplomatic crowd for decades. This is one of the most popular paladares in Havana, known worldwide for being included in the only Oscar award-nominated Cuban film, Fresa y Chocolate. Even though the neighborhood and its grand building have fallen into disrepair, it still feels special, like a secret. Guests climb a winding staircase to the third floor of a private building, then open the doors onto a vibrant, bustling restaurant that serves some of the tastiest food in Havana. Doña Eutimia is recognized as one of the best restaurants in Latin America. Guests venture down a small cobbled alleyway next to Taller Experimental de Grafica. Inside, visitors find antique furniture in a crowded space with a mix of locals and tourists. They serve one of the best versions of ropa vieja, the famous Cuban dish of pulled beef and sliced peppers in tomato sauce. The atmosphere is incredibly intimate: Most guests leave knowing many of the other diners in the restaurant. Alexie is a Cuban travel Svengali and tourism expert for Cuba Travel Network. You can follow Cuba Travel Network at @cubatravelnet. He travels to uncover secrets to share with all his new friends discovering his home for the first time.